Waste time at work efficiently! 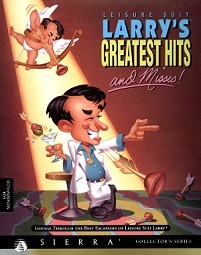 Larry has designed a program for everything you do at the office that has nothing to do with work. Create office pools, lotteries, read jokes, design memos, fax cover sheets and lots lots more! Outrageous clip art for memos and fax cover sheets will really impress your boss (try at own risk) and co-workers. "Anti-boss" safeguards help you keep your job by quickly changing your computer screen. With Laffer Utilities you may never want to do real work again! 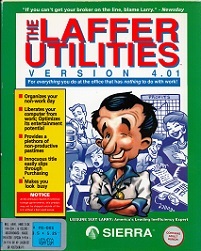 The Laffer Utilities, designed by Leisure Suit Larry creator, Al Lowe, was designed for Windows 3x. A spoof on Norton Utilities, it is labeled as "America's leading non-productivity tool". How about the oh-so-useful "What To Do?" program? 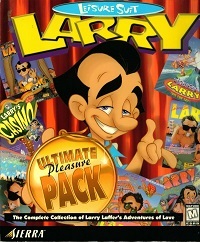 There you can ask Larry Laffer any question just to find that he responds with "Take a cold shower" or "Oh, yeah?" or "Are you crazy? You'll never get away with it". Most of the little programs included in this box are just time killers. Some however, such as the memo program, could have had some practical use... back in the early nineties. 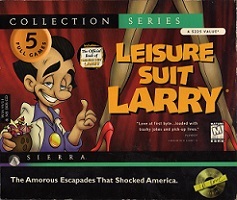 The Laffer Utilities were also included in various Leisure Suit Larry collections.